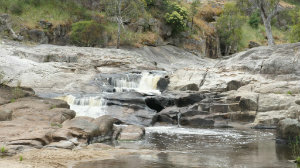 There is an easy walking track along the scenic Seven Creeks which was established by the Euroa Apex Club. Commencing at the Seven Creeks Formal Park (download PDF of map of walking track), the circuit follows the creek with one crossing at the Rockies (southern end) and the other at the Butter Factory Bridge (northern end). The track was established in 1988 as a Bicentennial Project. 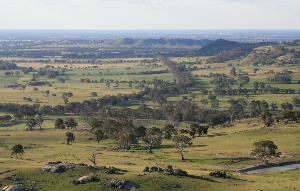 It extends for approximately 6.8 km along both sides of the creek through a redgum riverine plain. Fifty three species of birds have been identified along the creek, as well as platypus, koalas, echidnas, water rats and sugar gliders. Trout Cod, English Perch, Blackfish and other species are found in the stream. A fish ladder is located near the central section of the track. The Euroa Rotary Club initially set up a rotunda on Balmattum Hill. This is accessible from Strathbogie Road, although the entrance is not easily found (you will find it just beyond the freeway underpass). There is a short walk to the rotunda but if you really feel like a challenging climb, there is now a clear marked pathway, right to the top. This is a grassy walkway with many magnificent views along the way particularly looking west and south. A morning walk is recommended as later in the day you will be looking into the sun and your photos will not do justice to what is before your eyes. Note: if walking during the warmer months of the year watch out for snakes. The early buildings of Euroa are an inheritance from another world: when Victoria was a British colony at the height of Queen Victoria’s Empire. Its buildings stand as evidence of the confidence and foresight of early settlers and traders. Whilst still retaining their value as reliable premises, the buildings display an elegance and solidity lacking in modern construction. Besides buildings, a few other items of interest are noted herein. According to the Department of Planning there are buildings that offer great potential for conservation and restoration in harmony with growth of the future. From Euroa, take the Euroa-Mansfield Road towards Mansfield, at approx. 19km there will be a track on the left signposted Gooram Falls picnic area, turn left here. Note: there is not much warning. There are two picnic areas, the one at the top and one approx. 200m downstream. A lovely place for a picnic on a warm Summer's day. Polly McQuinns is one of Euroa's five water storages. There are several legends concerning this beautiful spot and how it got it's name, as it was once called Gall's Waterhole. One legend is that a man named Polly McQuinn live by the waterhole and did not have a beard, so his nicknamed Polly. The other is that Polly McQuinn drove with horse and cart into the waterhole and drowned and his ghost can still be seen. No one seems to know when the name was changed or even if any McQuinns did live nearby. The wall was built in 1933 and raised a further metre in 1949. During drought periods in the midday sun, you can see a vast rock just below the water surface in the waterhole. Click here for the Outdoors page for more information on fishing. The Rotary Club of Euroa has installed a directional cairn pointing out the many landmarks on the vast 360 degree landscape. Major geographical features, cities, surrounding towns and even London, New York and Paris feature on the plaque. The stone cairn is the work of local stone mason Howard Mitchell. Howard very generously donated his time and skills to erect the stone structure and set the plaque in place. The club is indebted to his contribution and believes the new addition is another interesting feature at the top of Mt Wombat. Interested visitors may not be aware that you can drive right to the top for a spectacular view and now some assistance in identifying interesting features.